The Golden State Warriors swept the first round of the playoffs with a big win over the Portland Trailblazers on Monday night. The game was never close as the Warriors posted 45 points in just the first quarter. The temail tied a record for most points scored in a first quarter of a playoff game (and the only team to score that many points on the road). With the win, the Warriors advance to round two and depending on when the Utah Jazz and the Los Angeles Clippers series is over will either start the next round on April 30th or May 2nd. Kevin Durant made was back from injury and made an impact in just the first few minutes of play. The true star, however, was Steph Curry who shot 37 point in only 30 minutes of play. Warriors 128, Trailblazers 103. The Toronto Raptors took a 3-2 series lead over the Milwaukee Bucks thanks to a big game from the Raptors’ Norman Powell. Raptors 118, Bucks 93. The Atlanta Hawks’ Dwight Howard finally showed up for the series and had a big game Monday night to help his team pull to 2-2 tie with the Washington Wizards. The story of the game was seeing 35 year old Jose Calderon making a significant contribution to the team (and getting the honor of sitting next to Howard at the post-game press conference. Hawks 111, Wizards 101. For a recap of all the games, click here. Former Minnesota Vikings running back, Adrian Peterson announced he will sign a 2 year deal (which is actually a one year deal with a one year option) with the New Orleans Saints. Peterson played 10 years with the Vikings and is ranked #16th in NFL history for rushing yards. The Vikings will play the Saints on Monday night football the first week of the season. Dale Earnhardt Jr. announced he will retire following the 2017 season. 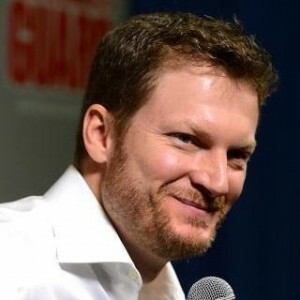 Earnhardt Jr won the Daytona 500 twice and was one of the most popular drivers in NASCAR history. He is the son of one of the founding fathers of NASCAR, Dale Earnhardt, who died tragically in 2001 in a crash on the final lap of the Daytona.